This 37,000 square foot addition provides research laboratory, classroom, and office space for the new Civil Engineering program at UMD and uses the building design itself as a teaching tool with structural systems on display. Major first-floor laboratory spaces include a high-bay structures lab with strong wall and strong floor, hydraulics lab with flume (both served by a gantry crane and aircraft hanger-style overhead door), and conventional soils and construction materials labs. Classrooms and office spaces are on the second floor. Structural systems include precast concrete plank floors on structural steel supporting access floor (for displacement ventilation) at the upper level. Foundations are conventional spread footings bearing on native soils. The roof areas are framed with structural steel, including steel joists over the high bay labs. Wall systems include metal-clad steel stud framing, masonry and insulated precast concrete panels. Unique exterior features include cantilevered scuppers to direct storm water to corten ring basins. 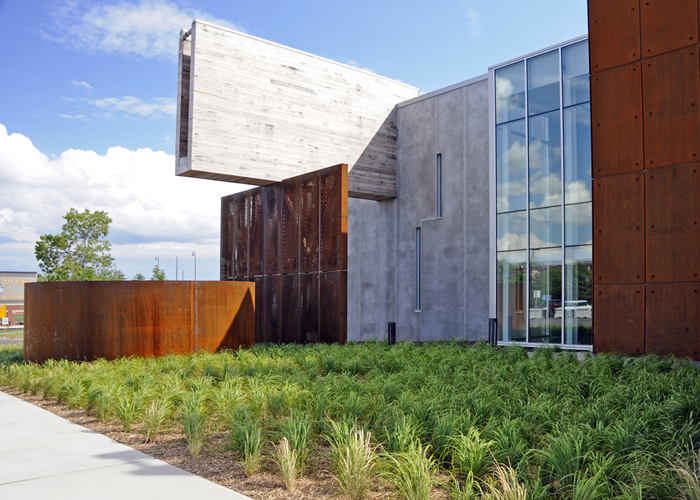 Much of the exterior consists of corten-clad wall panels. The project is registered for LEED Silver certification and incorporates a “green” roof into the design.